How To: Delete a project, to-do, knowledge, or issue workspace. 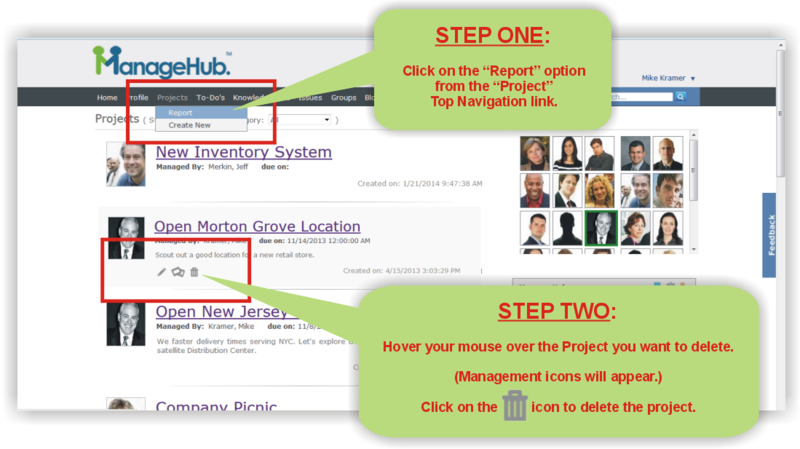 Follow these simple instructions to delete a ManageHub Project, To-Do, Knowledge, or Issue workspace. Deleting a workspace is easy to do. Simply, access the related report from the top-navigation drop-down list and hover your mouse over the workspace you want to delete. If you have permission (usually a Super-User or the workspace Manager) a set of management icons will appear. Click on the trash can icon to delete the workspace. Keep in mind that once your workspace is deleted it cannot be recovered. However, all associated workspaces are still accessible to those with permission.